Just how hard is it to beat the Aurora Curse? Find out here in Felix’s Report from the Round Robin stages in 2014……. Also featuring a Leroy chip-in for good measure. Leroy suggested we play the hardest consecutive holes and Felix agreed. 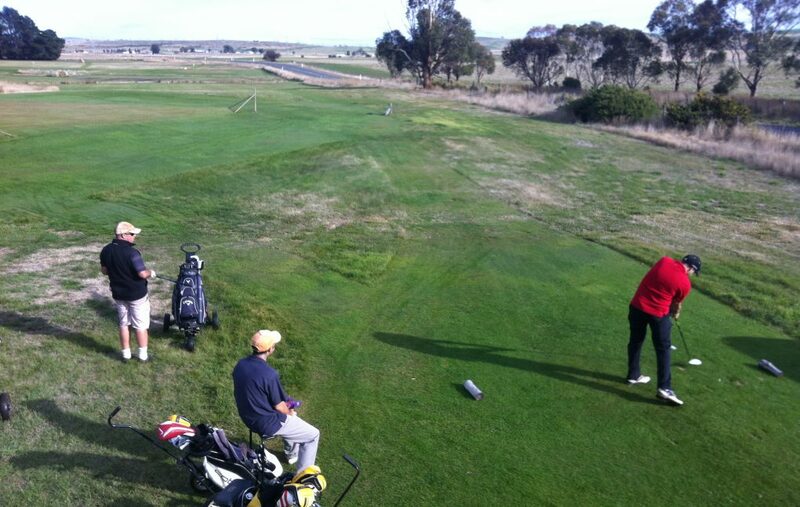 After a relaxed 7 holes of stableford, Leroy and Felix were both sitting well on 15pts. However the match started and the tension rose. 8th [Extra shot for Lwah on Matchplay Handicap] Felix and Leroy both hit 90% tee shots and both were 20m from the hole just off the green. Felix chipped 1st and put it to 3ft to put the pressure on Leroy. Leroy pulled out his 9 iron and chipped away, in a wanderer flashback for Felix BAM! in hole for a 25m bird! AMAZING shot Leroy! 9th An ugly hole for both, Leroy found the water (only just, 30cm higher and it would have been on the green) and Felix found the bunker. Felix scrambled for an 8 but just good enough to beat Leroy’s 9. 10th 2 good drives up the middle of the fairway, Leroy found the bunker for his 2nd and Felix found the green. A bad 3 putt from Felix proved costly as Leroy made a great 6ft clutch putt for bogey to tie the hole. 11th The nemesis hole was back as Felix lost his drive left near the fence, Leroy played a solid wood after a great drive and won the hole comfortably. 12th [Extra shot for Leroy on Matchplay Handicap] Leroy put his drive in Browns river and Felix hit a 5 iron up the fairway. With an extra shot for Leroy, Felix knew the water only evened things up and feeling the pressure found the bunker again. Leroy got dyslexic and pulled out his 9 iron instead of the 6 iron and luckily he smoked it as it just cleared the water and ended up just short of the green. Some horrible short play and both players ended up with a 7 with Leroy winning the hole on handicap. 13th Felix and Lwah played the hole almost identical, 2 drives up the left, 2 layups to about 40m and both on the green for 3. Lwah 10ft, Felix 8ft. Here the similarity ended as Lwah nailed his putt for a par and Felix couldn’t replicate and ended up with a bogey. Lwah 3 UP (3 to play). 14th Again Felix and Leroy went blow for blow up the fairway, both on the green for 3. Felix feeling the match was almost all gone, just wanted to gain some respectability back and concentrated hard. A 20ft putt acrros the hill for par was the result, Leroy an easy bogey and the match moved on for one more hole at least. Lwah 2 UP (2 to play). 15th Felix spanked his 3 wood down the guts and Leroy responded again with a blistering drive. The 2 approaches were just ok being a little right and short. Leroy got an easy bogey but it wasn’t good enough as Felix bombed a 25m putt from off the green and in for a birdie (Payback for the 8th). Leroy 1 UP (1 to play). 16th Felix put his tee shot right of the path and opened the door for Leroy. Leroy hit a great straight tee shot and we were all surprised when it ended up short in the marsh. The unthinkable had happened, yes Leroy forgot how to read again and used a 9 iron instead of a 6. Leroy got out of the weeds was 3 ft above the hole for 3. Felix found the green for 2 and had 12ft to go. Felix drained another one, par to win the hole and lucky too as Leroy sunk his for bogey. It was an eventful day, both finished with 34 stableford points and both Leroy and Felix take the lead in the Matchplay. Leroy getting the wrong club out of his bag once could be considered a lapse in concentration, but the fact it happened twice proves he was under the thrall of the Aurora Curse!! Posted on August 23, 2016 April 27, 2017 by Gentlepersons' World Golf Tour, Tasmania	This entry was posted in golf and tagged golf, kingston beach golf club, matchplay, tasmania. Bookmark the permalink. ← Bash’n’Dash 2015 – Leroy and Keith take it to a play-off.